An evening dinner with family friends. Try as we may, the word buffet seems inseparable with the words overeating and gluttony! The Jetty Restaurant solely serves food from its buffet menu except for a special cooked oyster dish at an additional $15+ per serving. Bread rolls and soup - pumpkin soup was rich, creamy and the consistency was just right - neither too thick nor too thin. Bread rolls were crunchy but soft on the inside and went well with butter, or the soup. Seafood and salads - I started my meal with seafood and salads. The cold seafood available included prawns, raw oyster, mussels, and an octopus salad. The oyster was definitely not fresh and left an unpleasant aftertaste. The prawn was an improvement and had the fresh original taste that cold prawns should have. Salads included regular garden salad, a potato salad and a (strange tasting) corn and beans salad. Average in taste and creativity. Western mains - hot meats include thick juicy steak with mushroom sauce, pork steak, sticky chicken wings and buttered barramundi fish. I always look forward to the steak, although some pieces are more tender and delicious than others. The chicken wing marinate was scrumptious and my sister had 6 pieces all to herself. Other dishes include pasta, potato bake, mixed vegetables and roasted vegetables including pumpkin, potato and carrots. The potato bake was enjoyable, with thoroughly cooked potatoes in a smooth creamy sauce. However, the roasted veggies were disappointing as they were either not cooked properly, or soggy instead of crunchy. Asian mains - crispy roast pork was the only dish I enjoyed in this section. The pork skin was exceptionally crunchy and the meat was tender, with just the right amount of flavouring. Otherwise, there were many typical Asian (or rather Australian Asian) takeaway foods including fried rice, fried noodles, fried (fake) crab claws, salt and pepper squid, plum chicken and spring rolls. I despise supposedly Chinese takeaway foods, it's oily and tastes nothing like anything I've eaten in China. Plus, the quality served here was not at all superior to the dishes from the cheap takeaway stores at your local shopping centre. Desserts - disappointing, as I'm certain the selection of fruits and cakes were better when we first dined at this restaurant years ago. I'm sure there used to be pavlovas and I love the crunchy exterior and sickly sweetness of pavlovas, tempered by a swirl of cream. But the cake selection today was limited to passionfruit cheesecake (slightly soft, but still yummy), unappetising lemon cake and chocolate cake, like the cheap kind you buy from supermarkets. Other: the environment was lovely, quite lively and busy but not too noisy. Lighting was dim and especially dark if you chose the seating option outdoors. However, outdoor dining is a charming experience, as the deck extends over the waters and gives a great view of the sea and coasts. Rating: 2.5/5 the quality and variety of foods was thoroughly disappointing, with a few redeeming exceptions. However, the feel of the restaurant and view outside still compels us to return when the occasion calls for something a little "fancier" than our usual haunts. Personally I prefer the taste and affordability of the eatery at the other side of the Wharf. In comparison with the other buffets in Darwin - for less than $30 we could eat a better seafood buffet, with more dessert and drink options at Sunset Restaurant, Skycity (Darwin's casino). But the Jetty is still cheaper than the $40+ Seafood on Cullen buffet although it's been too long since I've been there to compare the quality of food. Altogether I don't love buffets as I used to - although you can take "as much as you want" of anything and everthing, a meal with too many dishes spoils the enjoyment of each individual dish. Almost weekly visits for Sunday family lunches. I've taken more pictures since I first wrote up this post! Takeaway options - a variety of sushi rolls for ~$4 or $5 each. And sushi trays for ~$10. Good option for a quick, relatively healthy snack. Bento sets (black tray, top) - comes either with sukiyaki beef (this is the one shown above), teriyaki chicken or a combination of both. Each set comes with a generous serving of meat, rice, a small salad, and pickles. Taste is average. The teriyaki chicken is tender but consistently too salty. Good if you want a filling meal! Rainbow roll (black plate, middle) - 4 beautiful rolls, each with a different filling. These include one with prawn, one with smoked salmon and another with raw tuna. Looks good, variety is good and the plate is value for money. However, the taste was not particularly memorable. Chilli tempura sushi (yellow plate, bottom) - sushi roll filled with crumbs of fried tempura batter, served with chilli powder. The one here has too much rice and not enough crunch. Every time I have this plate I wish I was eating the crunchy, tasty chilli tempura sushi at Go Sushi in the city instead. Prawn avocado sushi (above) - my sister's favourite, prawn is of good, crunchy, just-cooked texture and slides down well with the avocado. Cooked salmon sushi (above) - tastier than the raw salmon variety (fried food is always tasty)! Looks good, tastes good. Chicken karaage (above) - fried chicken served with Japanese mayonnaise. Crispy, tasty and juicy on the inside, even better than KFC! Melts perfectly with a dip of creamy mayonnaise. I love this dish and always order it, mmm! Udon or soba served with soup (above) - we ordered a plain udon, but there are also options of prawn and a variety of meats with the soup. Soup is light but tasty, with wakame (seaweed). The texture of udon noodles was thick and just right consistency. The dish is quite plain if that is all you're ordering. But I would not recommend the extras - a long time ago I ordered a prawn udon, and the one piece of tempura prawn was hardly worth the extra $2.50. Daifuku - mum's favourite dessert. Nice sticky, floury texture, with a centre that has just the right amount of sweet red bean paste. Other: Bar Zushi has a nice feel - the Japanese-style interior design gives an authentic and calming atmosphere to the restaurant (although we all know the owners are non-Japanese Asians). The sushi train is a convenient and fun way of picking your sushi plates, although direct ordering is possible too. Sunday lunchtimes are a good day to go, with the $4 plates. However, it is busy on Sunday so a large group may have difficulty getting seats. Plus the table service may be slow because of the crowd. Rating: 4/5 a positive dining experience because of its convenience, comfortable and unique design and some good tasting options. Bar Zushi is definitely classy compared to other similar-priced takeaway options in Casuarina. 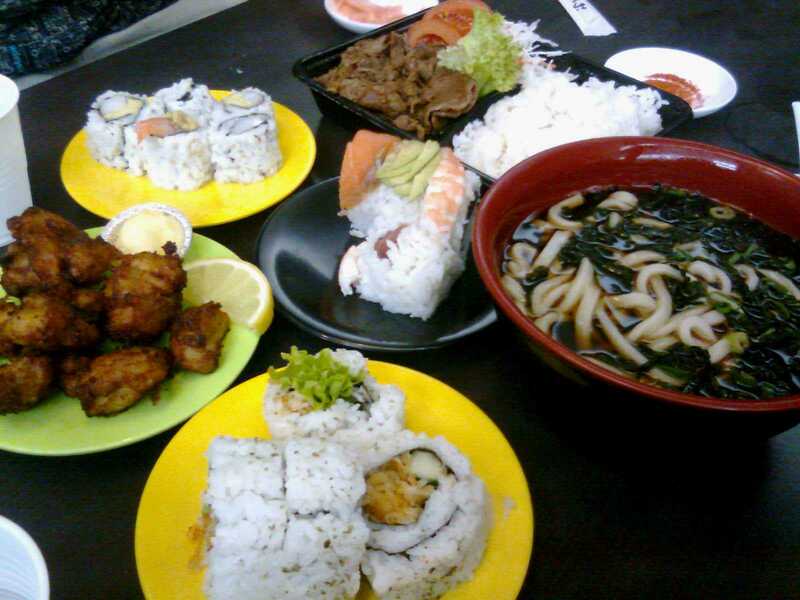 However, I can't but help compare this place with Go Sushi, which is the only other Japanese restaurant in town. We go to Bar Zushi for convenience, but Go Sushi (Japanese owned) for better and more authentic tasting sushi and sushi rice! A happy, chatty long-time-no-see meet up! Location: opposite Kmart at Casuarina Square, and adjacent to the Cheesecake Shop, see precise location here. Price: $10-15 for entree sized, $15-20 for main sized pizza and pasta. See full menu. Free bread: all meals are served with a slice of bread and butter per person. I love it because (it's free, and) you can fill your stomach a little as you wait for your food! Ravioli florentina (entree) - described in the menu as "meat-filled pillows of pasta tossed with bacon, spinach and white wine in a napoli and cream-based sauce". Pasta was of a good texture and I enjoyed the mixture of cream and tomato-based sauce. Linguine del mare (main) - seafood pasta also in a "cream and fresh tomato" sauce. The pasta was deliciously thick and had great texture. Sauce was tasty, seafood wasn't abundant but adequate. This is probably my favourite dish after eating at Fasta Pasta many times! Spaghetti bolognese (kid's meal): good old spag bol. Great, yummy, meaty sauce! Kids meals are good value and come with a soft drink and gelati for dessert (but make sure you ask for these because the staff seem to "forget" that these come as a part of the kid's meal deal). Cacciatore (entree): chicken pizza with capsicum and chilli. Good sized pizza even at entree size, hot and crunchy base and crust (thick, which I like), good blend of cheese. I also remember the vegetarian pizza from another time, which was very good, with a memorable assort of vegetables topped with the aroma of olive oil. Other: a clean and modern look inside. The restaurants provides a conducive for casual chats with friends; it's usually quiet at lunch time but can be busy in the evenings. Some self service is involved eg. taking your own water, and your own cutlery after you order and pay in the front. I didn't mind this, but felt that it was unusual. Staff here are usually friendly although I'm sure I've met one or two rude ones. Rating: 5/5! I don't mean the place or the food is perfect, but there are plenty of reasons to dine here. Fasta Pasta has branches all over Australia and I don't trust franchises, but the range of foods and taste is, in my opinion, comparable to the Italian restaurants on Lygon street in Melbourne (I lived nearby and used to eat there quite often!) Other pluses include convenient location, good ambiance and reasonable pricing. A pleasant cafe for a drink or meal after a free visit to the museum. Also our (secret) high school hangout for wedges with sour cream and sweet chilli sauce, mmm good memories! Vanilla milkshake: beautifully cool, thick and yummy but as with most cafes the milkshake was way too sweet! Beef vindaloo with yoghurt and grilled vegetables: lovely presentation and a variety of flavours. Surprisingly for a non-Asian cafe, this curry was quite hot that I had to take breaks in between my bites. The meat was reasonably tender and I enjoyed the variety in the accompanying grilled vegetables and yoghurt. Portion size was a little inadequate if you were hungry, and another downside was that the dish was served half warm - I don't mind eating precooked food but am fussy about food being thoroughly heated before it is served. Chicken nuggets with chips: part of the kids menu. The nuggets were tasty and uniquely shaped into round balls. The chips were extraordinarily crunchy, thick, and with just the right amount of salt. But kids are not too fussy when it comes to fried food and will enjoy it regardless! Other dishes: there were a range of breakfast options, and the other mains were typical cafe foods such as pasta, burgers and open grilled sandwiches. Other: there are indoor and outdoor seating options. Outdoor seating is relaxing and pleasant, with a a terrific view of the beach and the sea. The cafe is kid-friendly - my younger sister and her friend enjoyed drawing with the coloured pencil provided by the cafe. A favourite amongst locals for a casual get together in the evening (the only time when the weather is cool and breezy and outdoor dining is possible). Siam Thai - a selection of tasty Thai food. On my last visit, the pad thai (Thai noodles, see below) was good with crunchy peanuts and a sauce that was just right. This time, the serving size was good, however taste was slightly bland this time. But this was rescued by a decent squeeze of lime and a large scoop of chilli sauce. In our last visit, the beef salad with rice was also very tasty and filling. Beef was of good texture, the dish was spicy and delicious. There are a range of other stir fries, curries, soups, many that I have yet to try. Most come with chicken, beef, seafood or vegetarian options. Kim's on the Wharf - there is a selection of fish and chip stores at the Wharf but I've heard they are owned by the same owners. The prices and food range between the stores are very similar. The dish below is crumbed local barra with prawns, calamari and chips. The slice of fish was large, but the batter wasn't fantastic, taste was average. Schnitzel Magic - my friend had a crocodile steak with chips from this store which looked and tasted quite similar to the fish and chips above. This store has a range of "exotic" schnitzels and burgers - emu, kangaroo, croc, camel... interesting if you're feeling adventurous! The Icecream Shop - we used to go for cheap ice creams quite often on the Wharf. Delicious, large scoops and a range of unique flavours. Other: When you order food you're given a buzzer that beeps when your order is ready - quite high tech for takeaway stores in Darwin! Ambience is great around sunset - cool evening breeze with a lovely view of the sea, coast and clouds. Sitting near the edge we spotted a range of fish in the water - tiny fish, big fish, long fish, flat fish. However, at night time it does get dark and it becomes difficult to see what you're eating. Also most days the Wharf is crowded and quite noisy, although there are usually seats available away from the crowd. Rating: 5/5 for the unique, classically Darwin dining experience. However, rating of the food itself is 3-4/5 depending on what you order.